"I'm not a psychopath, Anderson, I'm a high-functioning sociopath, do your research." I am a big Arthur Conan Doyle fan, including his Sherlock Holmes stories. There have been a lot of attempts to bring them to the big screen, including film and television, some good and some pretty awful. The latest Robert Downey jr efforts are entertaining and exciting but not Sherlock Holmes in any real sense. They share the name of the characters and setting, and have a sort of random mix of themes from the books, but are so out of step with the feel and concept of the stories that they just don't work for me. 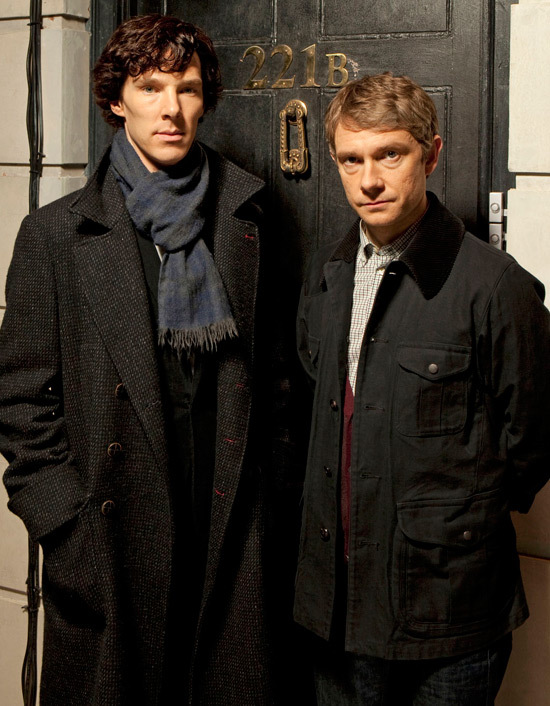 The best recent adaptation is a British show called simply "Sherlock" which is adapted and set in the modern era. The first show "A Study in Pink" was a rewriting of the first Sherlock Holmes story "A Study in Scarlet" which introduced the characters and their setting. The "Sherlock" version has Watson as an Afghanistan vet and doctor, and followed much of the dialog and setting, updating where needed and useful for the story. The character of Watson is played by Martin Freeman, known for his previous roles in The Office (the original BBC version) and The Hitchhiker's Guide to the Galaxy. He's less a confused bumbler than his previous Hitchhiker role, and is actually more capable and interesting than the Doyle version without violating the books. His status as a soldier is played up some, showing what is only hinted at in the books of him being nearly fearless. He is a very capable doctor and his skills are actually valuable to Holmes as more than a person to ask him questions and look impressed. Watson is actually the main character. Sherlock is played by Benedict Cumberbatch who is unfamiliar to me but has been in a long list of British projects, and is the voice of Smaug (and the Necromancer) in the Hobbit movies coming out in the next two years. 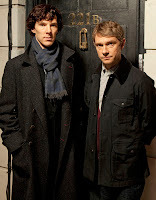 He's brilliant in the part, and Sherlock is played as he puts it a "high functioning sociopath." He's insufferable, insanely focused, totally dispassionate about life except his focus on crime, and would be awful to live with. At the same time, he retains that fascinating charm that Holmes needs to be tolerable. The drawbacks of the show are few. Holmes is stunningly brilliant and observant, but at the same time will - for reasons of plot or drama - simply miss the most blatant clues. The first episode had a cringingly strong example of that when he simply ignores taxi drivers and goes off with a serial killer just to set up a well-written but pointless confrontation and establish why Watson is so useful and liked by Holmes. There has been the unfortunate but inevitable reference to homosexuality through the show as well. Every one of the three episodes I watched on Netflix had a reference to homosexuality, including the first episodes long, repeated conversations on the topic, always rushing to insist its perfectly fine. I suppose the writer decided it had to be done because everyone would figure two close friends had to be queer, but it was overdone and annoying, damaging my enjoyment. In fact it was a bit jarring, and something Holmes wouldn't even care to talk about. Sexuality and relationships are irrelevant to him except where it comes to criminal activity, and that's something the modern PC BBC writer is never, ever going to touch on - unless its about a catholic priest molesting a child. I also think it was a mistake to make Moriarty such a main character so early - and the man playing him was poorly cast. He's too young, too playfully fay and just doesn't make sense at all to me. He's prominent in every episode, behind the scenes and completely revealed in the third show. This spoils a very useful ongoing story but I think I know why they did it. Previous holmes TV programs have done just that: given small behind-the-scenes hints of Moriarty and weaving him through the stories such as the brilliant Jeremy Brett series (the best adaptations of the original stories ever done in my opinion). And I think they wanted to do something different, since BBC viewers would likely be familiar with this theme. In any case, the show is very very good and well worth watching, even if it has a few small flaws. The characters are very well conceived and understood, the dialog is well written, and it heavily relies on Doyle's original writing and stories while updating them enough to make them unique and fresh for even old familiar readers. I highly recommend the show. What did you think of their portrayal of Mycroft? I'm almost finished watching the (more recent) Battlestar Galactica series, and just added this to watch next. Sounds great, thanks! I liked Mycroft a lot, he was terrific, but I do have one quibble: he's a lisping effeminate mincing sort of character too. Its almost as if the people behind the show really like that kind of character. Maybe its some in joke in England, maybe they're trying to reverse the usual portrayal but its odd to me.